Happy Friday. Today the theme is the ocean, specifically the Mediterranean. I found a manicure I hadn’t posted yet, that fit into this theme. I used two coats of Barry M Sky Blue and two coats of Revlon Whimsical. 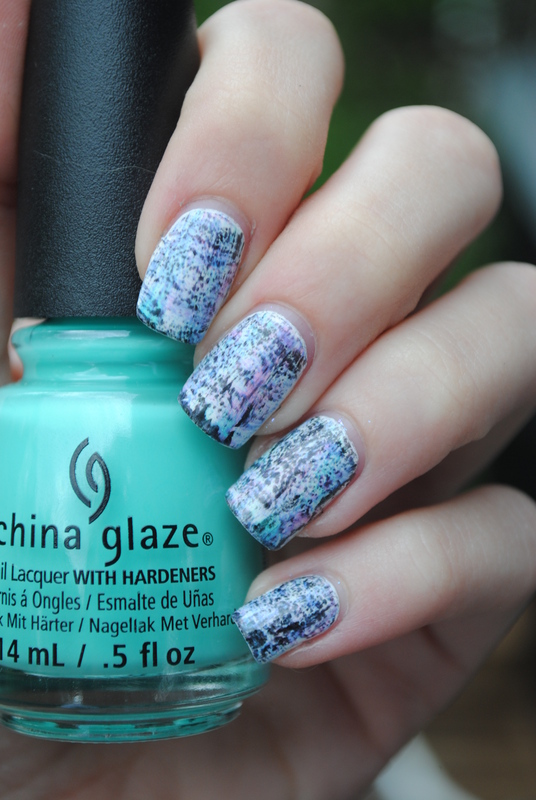 The color represent the ocean, while the blue and pink glitter can be the seashells. The white stamping is how the sunlight catches the reflection of the water. The stamping is from the Bundle Monster XL16 plate. Remember to click by the other ladies. I dag er temaet middelhavet, og jeg fandt en gammel manicure jeg ikke havde postet der passede ind i temaet. Husk at klikke forbi de andre for at se hvad de har fundet på i dag. Happy friday. I just came home from a little extra vacation in Malaga, Spain. I had a great summer and have two more weeks left before I start my internship. Today the theme is neon, and what is more fitting during the summer months. I love neons, and have been on a hunt for a dupe for the original Flip Flop Fantasy from China Glaze, and I think I have found a really close one, which I’m wearing today. I’m planning on doing a huge dupes post for Flip Flop Fantasy, because I have a lot of close polishes after a year of searching. I have three coats of China Glaze Shocking Pink on my index and pinky nails. This looks really close to the original Flip Flop Fantasy. I have three coats of Wet n Wild French White Creme on my thumb, middle and ring finger. I stamped with the MoYou London Pro XL 06 plate on my thumb and middle using MoYou London Black Knight. On my ring finger I stamped with the MoYou London Fashionista 04 plate. I added a little bit of China Glaze Shocking Pink to some of the petals on the flower nails, to add a pop of color on those nails as well. If I do it again I will probably do a little bit of dry brushing on the nail before stamping. Remember to click by the other ladies to see what they did for today. I dag er temaet neon. Jeg har fundet en lak der er ret tæt på min yndlingsneon lak fra China Glaze Flip Flop Fantasy. Husk at klikke forbi de andre for at se hvad de har fundet på. Happy friday. Today is the world day to combat desertification and drought, so we are doing desert nails. I decided to do some sand nail art, which I also did almost a year ago today. I used Chalkboard Nails’ tutorial for her beach nail art. It is pretty simple to do. I started with three coats of Sally Hansen Malt. I mixed Malt with black and white to create the different colors for the sand. I dotted them on randomly with a small nail art brush. I like the nail art even though it is really simple. If I had more time, I would have been more creative, but for now this will do just fine. I thought about combining the sand with a cactus, but ended up going the simple route. I dag er temaet FN’s dag for bekæmpelse af ørken og tørke. Jeg har lavet sand nail art, for hvad er der ellers i en ørken. Happy friday. I had my first exam today, and came out with an A. I had not expected this great of a grade, since it was a really hard exam and I would be happy if I just passed the exam. Today we are doing graphic nail art. I had another idea in mind, but because of the exam, I had to be something quick to do. 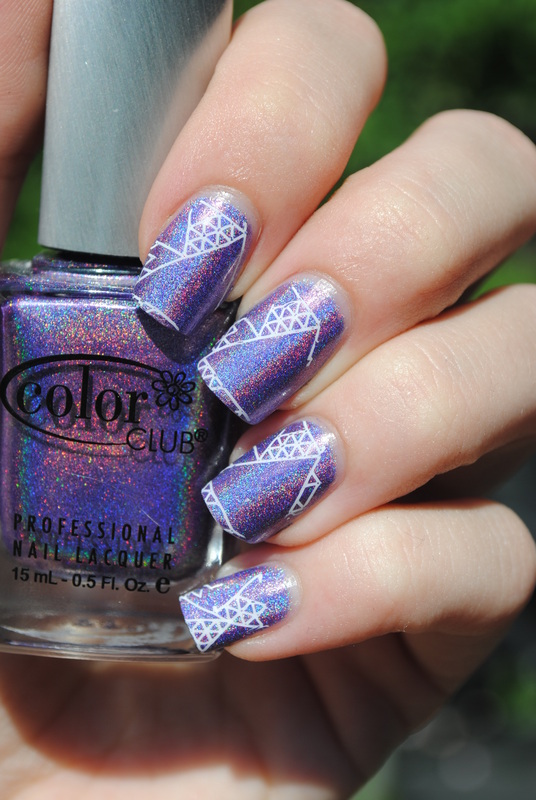 I started out with two coats of Color Club Eternal Beauty, a purple holographic polish, that really shines in sunlight. I stamped with MoYou London White Knight and MoYou London Hipster 07 plate. The stamping was a little hard to transfer because of the thin lines. I dag er temaet grafiske negle. Jeg valgte lidt stamping, da jeg ikke havde meget tid på grund af en eksamen i dag. Jeg elsker holografiske lakker, og i disse solskinsdage kommer de virkelig til sin ret. Happy friday. Summer is almost here, at least the temperatures are high and the sun is shining most of the time, I love it. I have been outside in the sun for as long as possible, to soak up as many sun rays as possible before they leave us again. I did another dry brush manicure for the base of the nail art. It is so easy and fast and looks really good. I started with two coats of OPI Don’t Bossa Nova Me Around. Then I dry brushed using China Glaze Glow With the Flow, OPI Kiss Me I’m Brazilian and China Glaze Feel The Breeze. 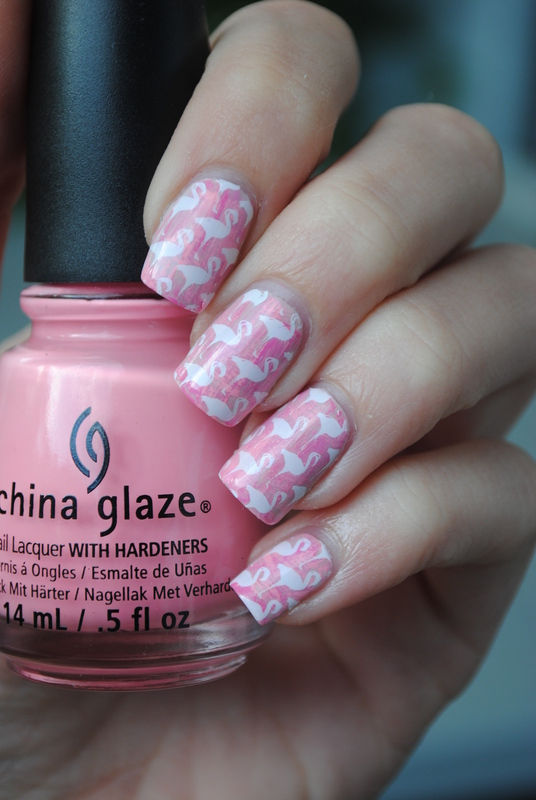 I then stamped a flamingo pattern on top using MoYou London Tropical 16 plate and MoYou London White Knight. 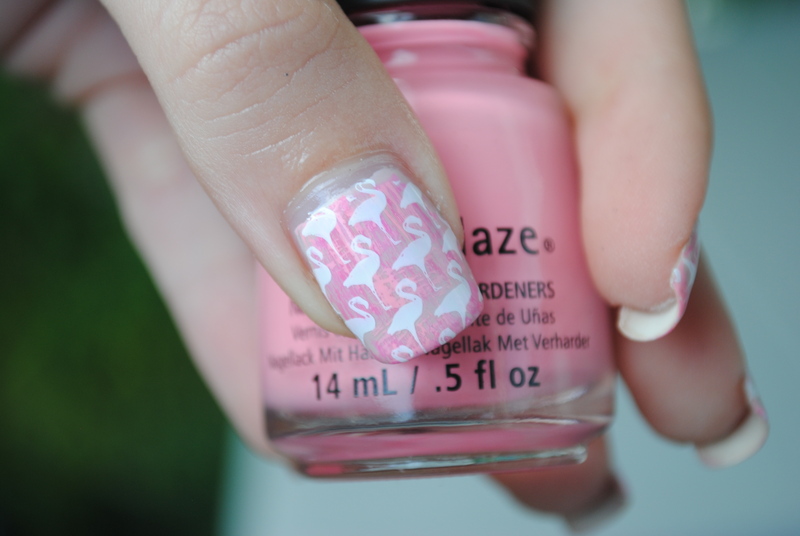 I have wanted to do flamingo nail art for the past couple of months but never had an occasion to do it, but I thought the pink color of the flamingo is very summery and flamingos also remind me of Florida, the Sunshine State. I dag er temaet sommer. Jeg har haft flamingo negle på hjernen i et par måneder og tænkte nu måtte det være. Jeg elsker deres fine lyserøde farve og så minder de mig om Florida og solskin. Happy Friday. My favorite color is purple, but I have done a lot of nail art with the color lately, so I decided to switch it up. Also really like blue so I found a couple of new blue and purple polishes I hadn’t used yet and did a dry brush manicure, inspired by Chalkboard Nails. I started out with a base of Wet n Wild French White Creme. On top of that I dry brushed with China Glaze Too Yacht To Handle, Picture Polish, Blue Bird, Forget Me Not and Spring. On top of that I dry brushed with OPI Black Onyx. It’s been a while since I have done a dry brush manicure, but it is a really easy and fast to do, and has a really cool effect. Remember to check out the other ladies and their nail art. I dag er temaet yndlingsfarver. Jeg elsker lilla og blå, så jeg fandt nogle forskellige blå og lilla farver jeg ikke havde brugt før og lavede en dry brush manicure med. Husk at klikke forbi de andre for at se hvad de har fundet på. Happy friday. We have had the most wonderful weather in Denmark the past week, sunshine and high temperatures everyday. Todays theme is our go-to manicure. When I don’t know what to do, I usually just go for a skittlette manicure. It doesn’t take too long to complete and the different designs and textures makes it interesting to look at for a longer time. I started with three coats of OPI Chiffon My Mind on my thumb, index, middle and pinky fingers. I left the index and pinky nails alone. For my thumb and middle finger nails, I stamped using MoYou London Black Knight and MoYou London Pro XL 06 plate. That floral pattern is my favorite stamping pattern, and I have used it many times, when I don’t know what else to use. On my ring finger I have two coats of OPI Ce-less-tial is More. This manicure turned out super clean and summery. Remember to click by the other ladies to see what they did for today. I dag er temaet go to mani. Jeg ender typisk med en skittlette hvis jeg ikke ved hvad jeg ellers skal lave, da den er nem og hurtigt at fuldfører. Husk at klikke forbi de andre for at se hvad de har fundet på i dag.